The record number of fish carried in a single puffin’s beak is 62. The haul consisted of 61 sand eels and one three-bearded rockling. Hokey smokes, I can't believe I ate the whole thing. 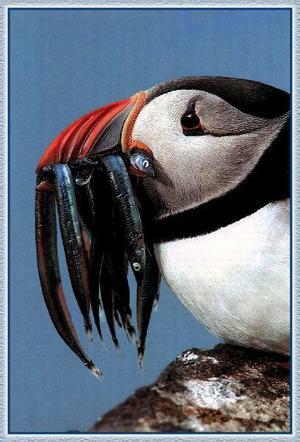 That would be quite a meal, if it were only for one puffin! In all likelihood the bird with the 62 fish was also feeding both its puffin spouse as well as a hungry chick. Still, quite a feast (ten fish is a more typical haul, according to the Audobon Society's Puffin Project. Windsurfing today off of Sebonac Inlet on the Little Peconic we saw quite a few puffins. They looked good and fat to me, so I'm thinking the fishing has been good. Joe, I've been thinking about your Friday fish series, and thinking that I might do well with a regular Sunday puffin item. I'll let Puffin Greatness stand for another week (out of respect to the 62 fish) but next Sunday we'll be back with a new installment.